This may mean that your sensor is not connected properly, or your console software might need updating. To resolve this problem, try the following solutions. Insert a Kinect game disc. Start the game from the Xbox Dashboard. Update Required: An update has been found. To apply this update, you must restart your console. Select Yes, Restart to install the update. Unplug the sensor from the console, and then plug the sensor into the AUX port on the back of the console. 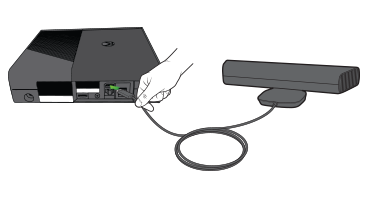 Important Remove the power/USB adapter cable if your Kinect sensor came with one. Unplug the sensor from the console, and then plug the sensor cable into the AUX port on the back of the console. Make sure the power cord is plugged into a working electrical outlet. Make sure the USB connector is plugged into the back of the console. The light located near the middle of the cable should be green. Note If you do not have a green light on the cable, try plugging the cable into another outlet to make sure the cable is working properly. If you still don't see a green light, your cable needs to be replaced. You can order a replacement cable from Device Support (sign in with your Microsoft account and then select Replace an accessory). Console registration may be required. If the previous solutions didn’t resolve the problem, go to Device Support and select Repair my device to request a repair. Repair or warranty questions? 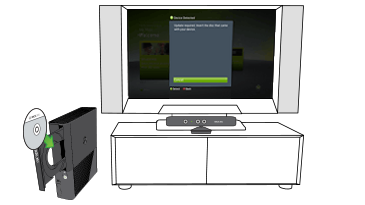 See Xbox warranty and registration FAQ. Would you like to contact Support regarding the "Error C00000C2 occurs when you try to use your Kinect sensor" issue you were reading about or a different issue?